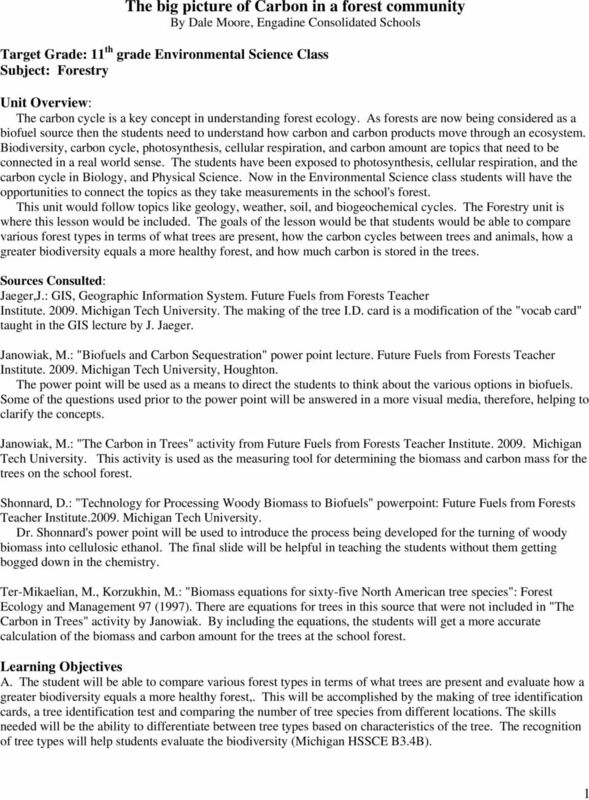 Download "The big picture of Carbon in a forest community By Dale Moore, Engadine Consolidated Schools"
How is carbon stored in trees and wood products? 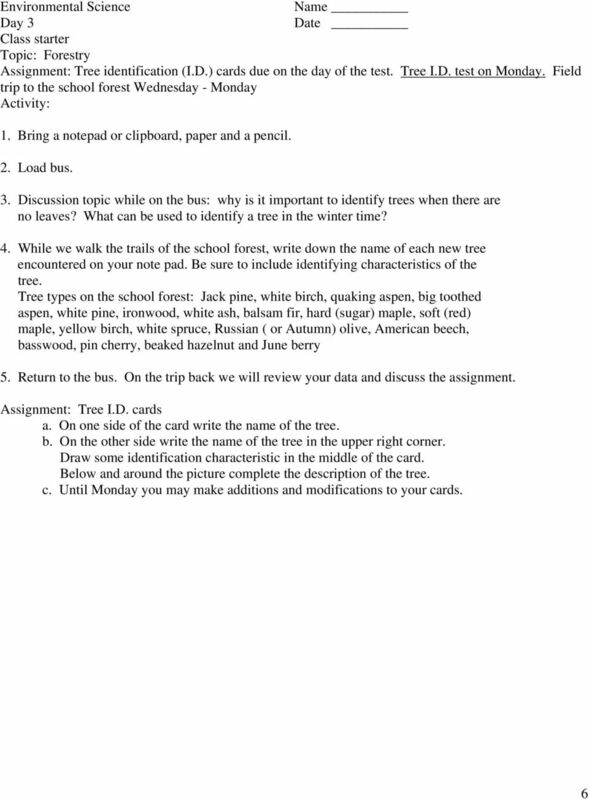 Take-home Activity. 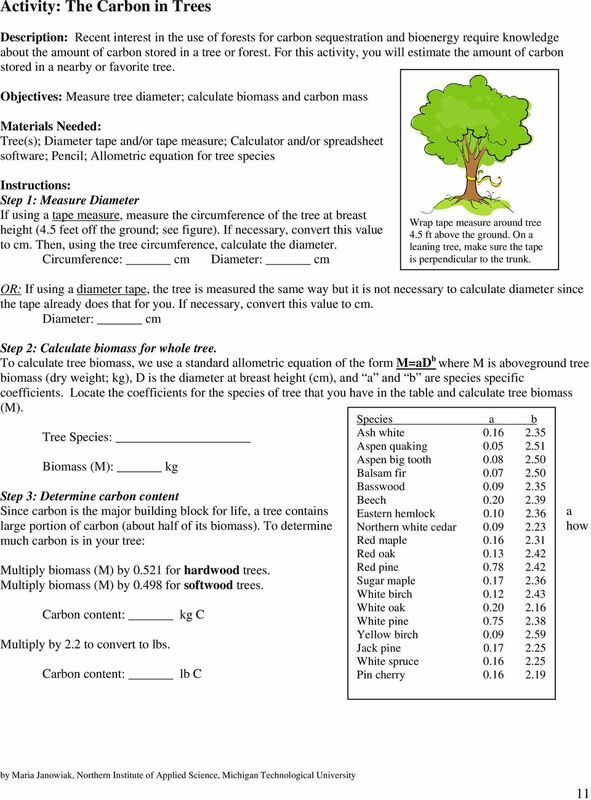 Calculate the benefits of the trees at your house! Forestry Terms. Allowable cut The volume of wood that can be cut during a given period without exceeding the forest s net growth. Forestry Terms Acre A land area of 43,560 square feet, approximately 209 ft. by 209 ft. Allowable cut The volume of wood that can be cut during a given period without exceeding the forest s net growth. 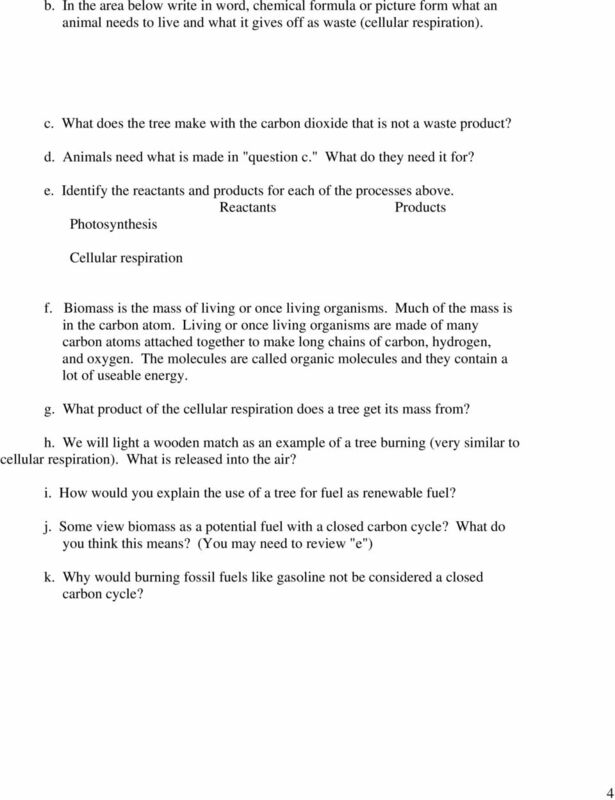 Students will describe the carbon cycle and the journey a carbon atom might take on its way through this cycle after participating in a simulation. 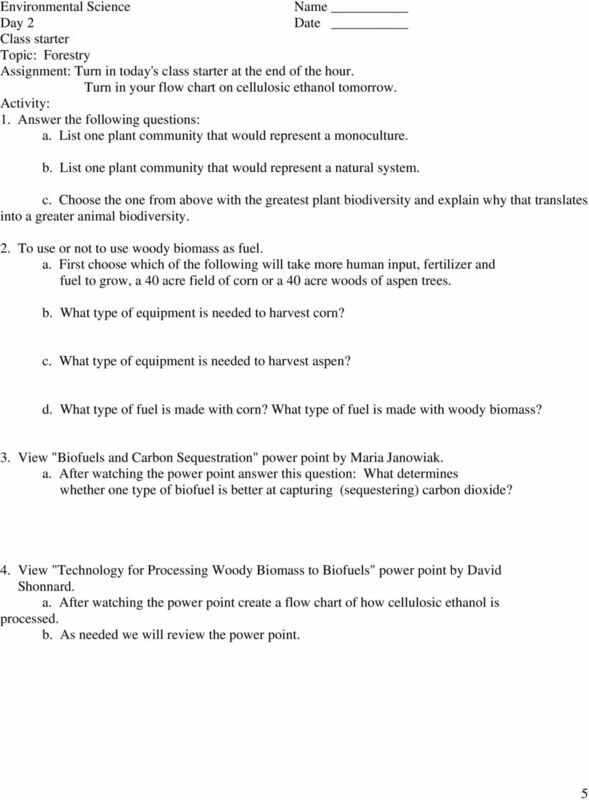 Assessment Bank Matter and Energy in Living Things SC.8.L.18.4 1. What is energy? A. anything that takes up space B. anything that has mass C. the ability to conduct current D. the ability to do work 2. 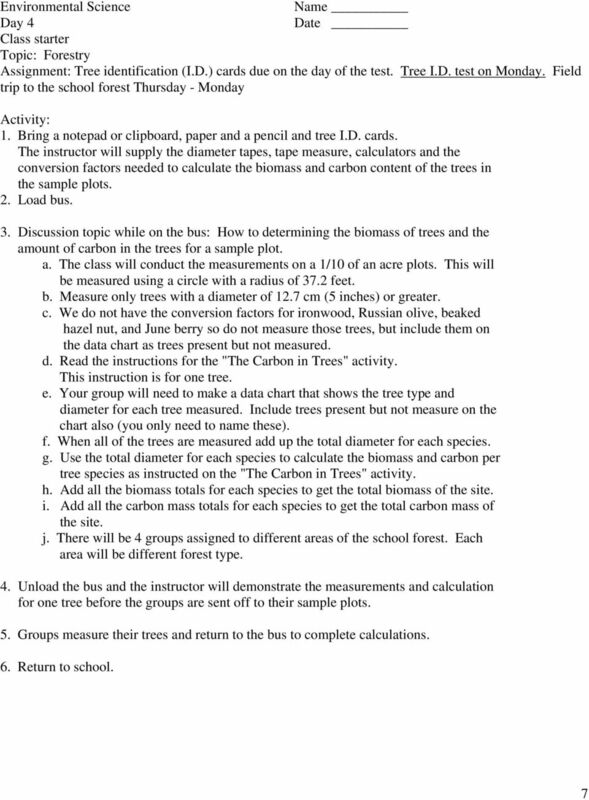 Introduction to the Scientific Method What habitat at your school has the highest insect biodiversity? a. a population. c. an ecosystem. b. a community. d. a species. 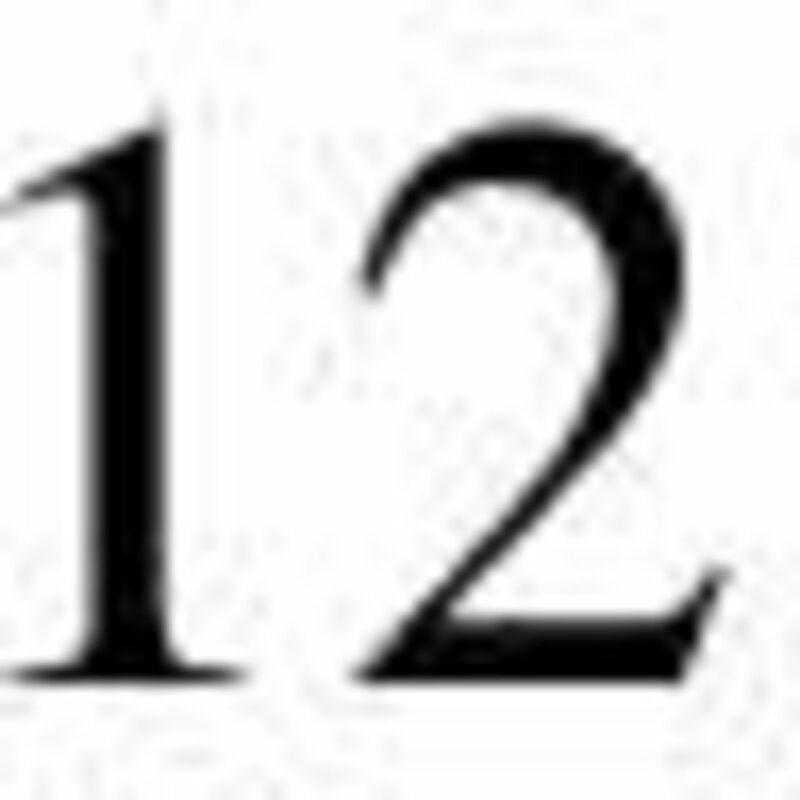 13.1. Principles of Ecology CHAPTER 13. 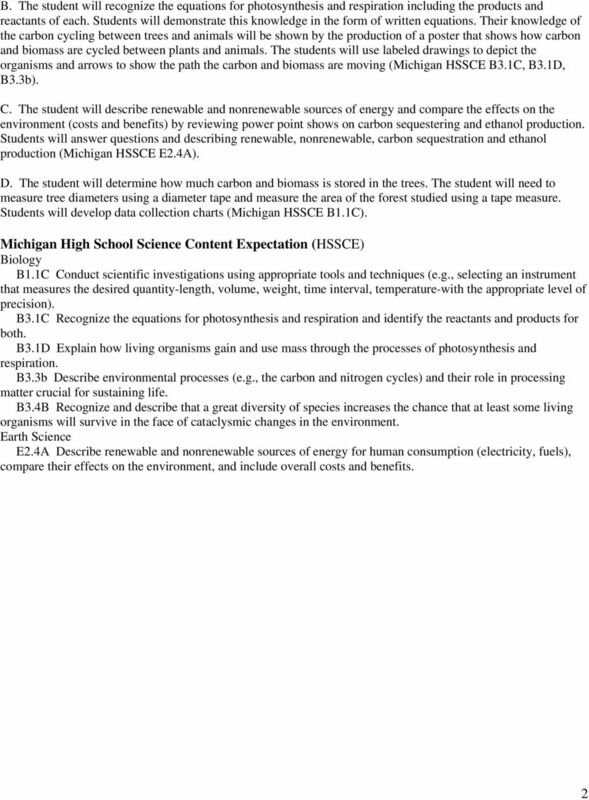 Ecology is the study of the relationships among organisms and their environment. Energy Flow. Background. The following page illustrates a sample diagram of a food chain. PHOTOSYNTHESIS. reflect. what do you think? Soak Up the Sun How do organisms get energy and matter? Energy is the ability to do work. Matter is anything that has mass and takes up space. All organisms need energy and matter to live, grow, and reproduce. 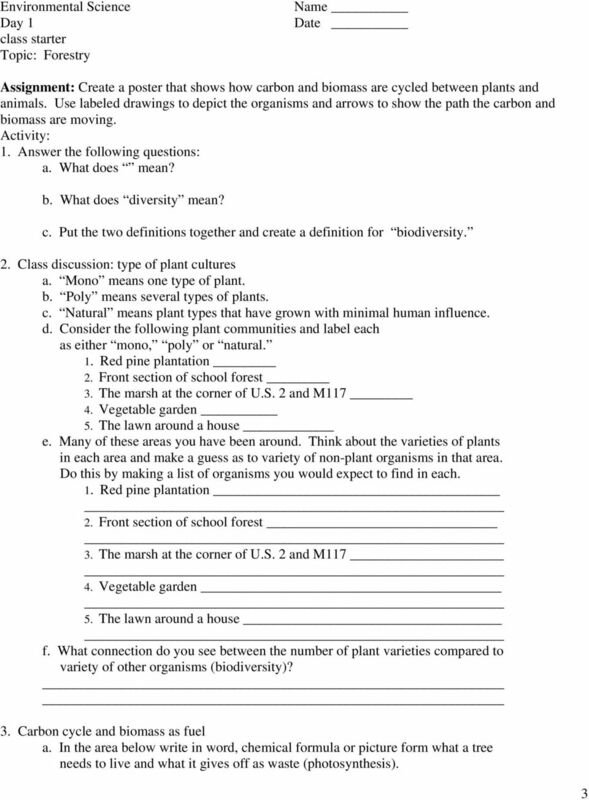 The Effect of Sea Level Rise on Salt Marshes Student Activity Sheet Name Date Class The global climate is changing at a rate never seen before in the Earth s history. Climate change has caused global warming. Which of the following can be determined based on this model? The atmosphere is the only reservoir on Earth that can store carbon in any form. A. Earth s Cycles 1. Models are often used to explain scientific knowledge or experimental results. 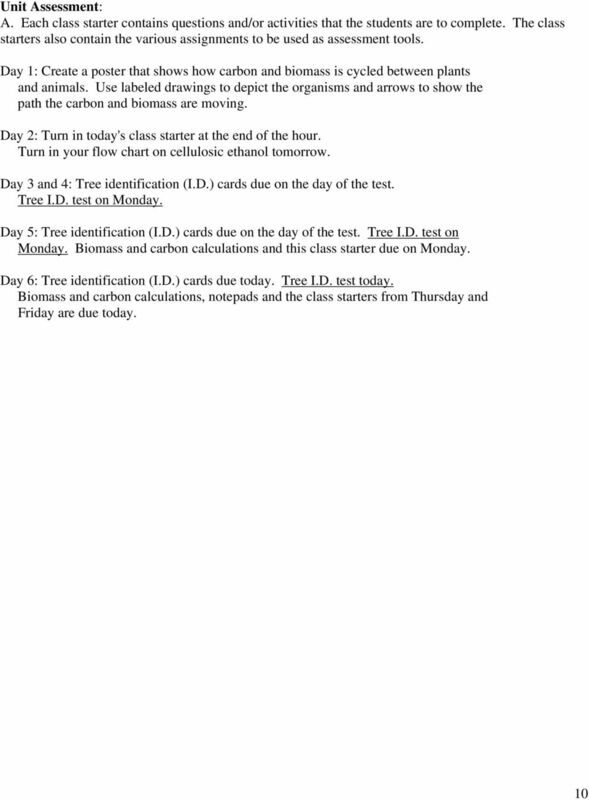 A model of the carbon cycle is shown below. Which of the following can be determined based on this model? Complete a table of values. Graph the values given in a table. 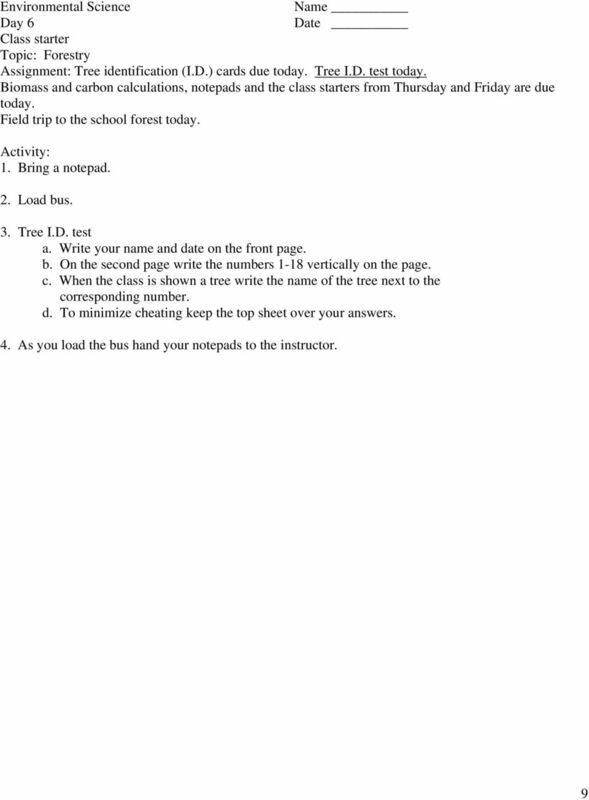 Create an equation representing the information in a table or graph. 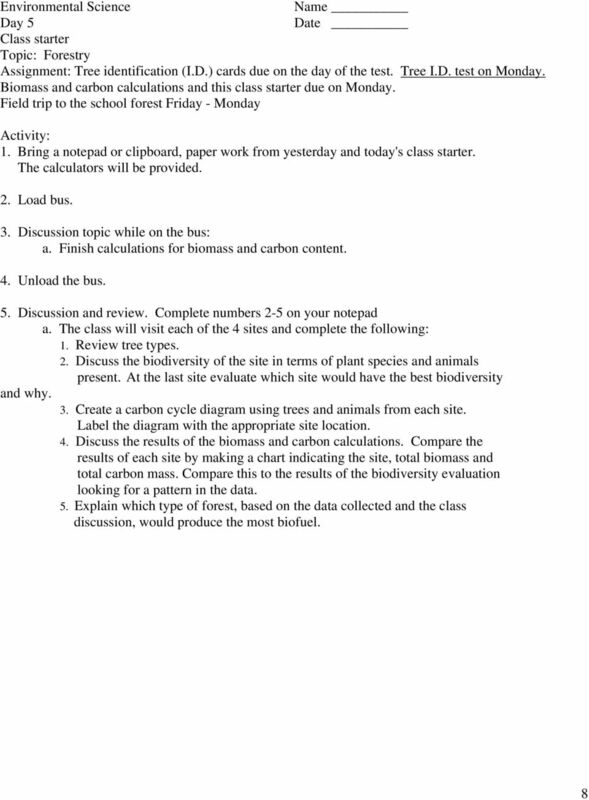 2.5: Energy Flow in Ecosystems pg. 38. Radiant Energy: energy that travels through empty space. To help teachers guide their PreK-2 students through the Vanishing Acts exhibit. What will happen when we completely run out? What are some alternatives to using these sources of energy? of relationships that exist are parasitic relationships and mutualistic relationships. Apple Tree. I think the food is made in the tree s roots. I think the food is made in the leaves of the tree. Chapter 3 How Ecosystems Work. You could cover the whole world with asphalt, but sooner or later green grass would break through.